If you've read through my posts, you'll see quite a few write-ups for places that I thought were pretty good, a fair amount for places that I absolutely adored, and a few for places that I just plain despised. That isn't to say that I don't go to eateries that I don't have any strong feelings about either way, or that I dislike just enough that I'm likely not to return, or that are just okay but I'll never go back because there are too many other eateries to choose from...it's just hard to work up the enthusiasm to write about them. Eventually I accumulate enough of those places that I'll just combine them into one piece and get them off my to-do list. This time I decided to compile a day's worth of meals as kind of a fun theme. So, let's talk breakfast. The two pictures above are breakfast selections from Kneaders in Meridian (the more astute among you may have already caught that), the Chunky Cinnamon French Toast and a bacon, egg and cheese sandwich on croissant. I've actually eaten at Kneaders several times, but never really made note of it because in my experience their food lacks really any kind of flavor. I've heard good things about their desserts, but have yet to try them. The quality of the bread products involved in their entree options is good, but they really need to punch up the taste component. The Chunky Cinnamon French Toast has no real cinnamon flavor, and the croissant sandwich was in need of both salt and pepper (a little smokiness to the bacon wouldn't have hurt either). Our next two pictures are from Blazen Burgers in Nampa, a Blazen Burger and an order of tots (a weakness of mine). I'd had high hopes for this place after doing some research and finding that they are basically "it" for indie drive-through burgers in Nampa. Between this and my experiences with Wheelers, I've all but given up on finding a decent burger in the Nampa area. The oil the tots were cooked in had seen better days, but the burger was the real shocker. A decent amount of customization options are available, and I ordered mine with bacon, cheddar and an extra patty. Blazen dresses their burgers with lettuce, tomato, relish (yes, relish) and "special sauce". Despite all of that, the burger was dry. VERY dry. As in I wouldn't have been able to finish it if I didn't have a beverage handy. I'm not even sure how you make a double cheeseburger that dry without trying to. I mean I didn't even need a napkin for this thing, and that's just sad. A smaller complaint is that the second patty for an additional $1.75 apparently didn't justify adding an additional slice of cheese. That's expectation was my fault I suppose since the menu didn't indicate that it would be the case, but when was the last time you got a double cheeseburger with only a single slice of cheese? Finally, we find ourselves at Chapala in Garden City for dinner. Super friendly staff, appropriately horrifying decor, but the food was firmly in the "meh" category. 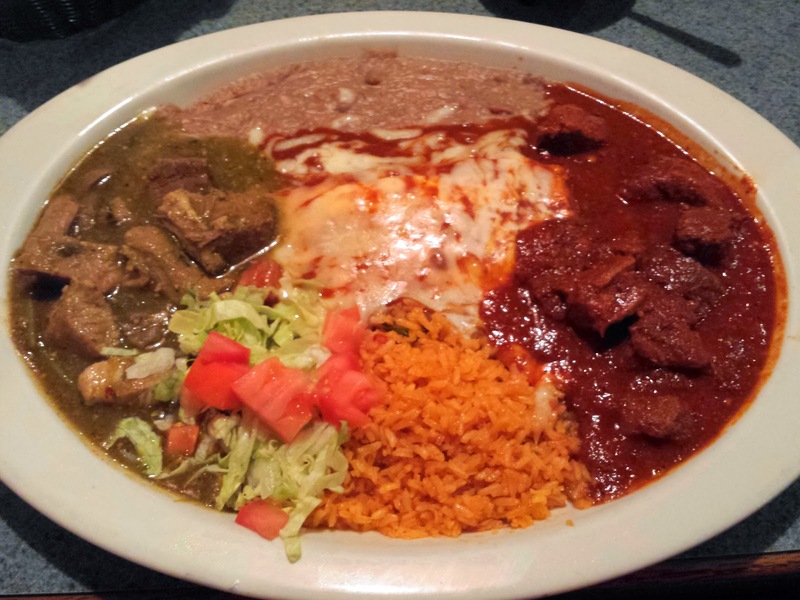 I ordered the The Three Chilies platter, consisting of chile verde, chile rellano and chile Colorado. The rice and beans were pretty standard, but the rest of the items had varying degrees of success. 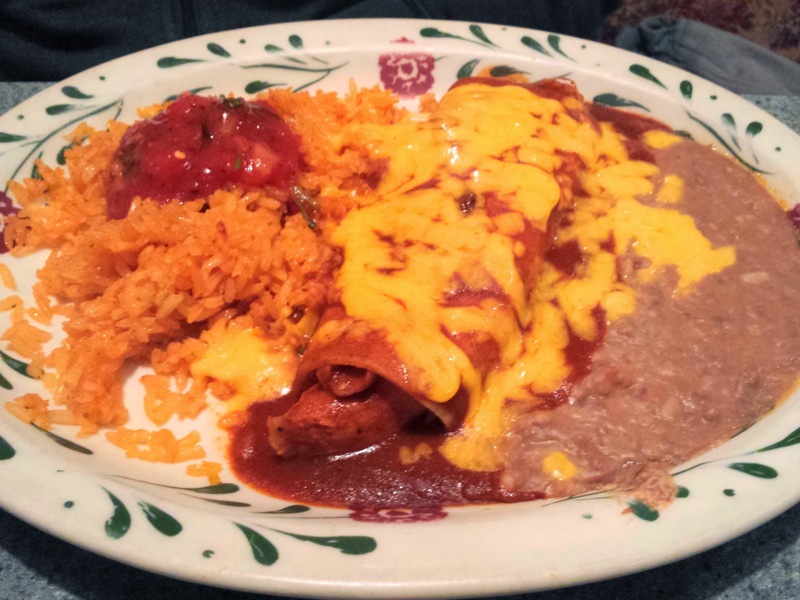 I liked the sauce on the chile verde, but the pork could have been cut into smaller pieces or cooked longer. I say this because the meat was very firm but the silverware definitely was not. In fact, it was so thin that my fork literally bent when I tried to use it to cut the pork. The chile rellano had a decent flavor, but I felt that the egg component had a slightly strange texture. As for the chile Colorado, the sauce was just plain strange, slightly reminiscent of a bland Italian tomato sauce. My roommate's chicken enchilada got an "okay, but nothing special" verdict. In the end, three places that aren't bad, but which I can't see myself returning to for another meal when there are so many good and even great eateries around. Still, tastes and opinions vary, and all three have quite a few supporters (and two have multiple locations), so make up your own mind. And as always, if you think I've missed out on something amazing, feel free to let me know.